While I was working as Chief Deputy and later Sheriff of Crockett County, Texas, I was pleased to meet Tol Dawson, a retired Texas Ranger living in Del Rio, Texas. Tol made some of the nicest gun rigs that I had seen in quite some time. 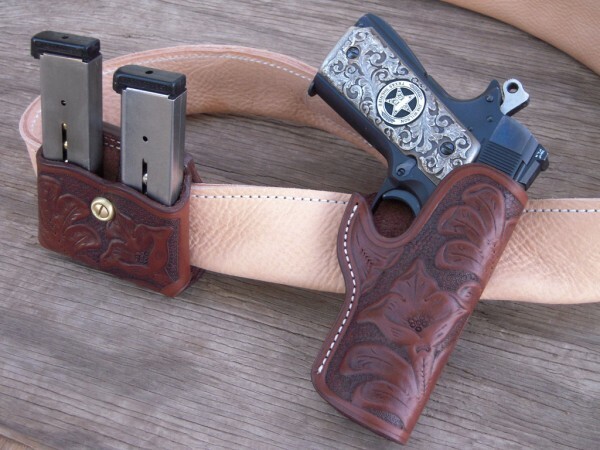 I had him make me one of his holsters for my Colt .45 Commander, a magazine case, and a chap-leather gun belt. You western movie fans know where I got the idea for the chap-leather gun belt. What I found was that the soft chap leather was mighty comfortable, especially when I was wearing it for 10-12 hours a day. The older you get, you learn that comfort is not a bad thing. At any rate, a lot of us wore Tol’s holsters, including my friend Joaquin Jackson. We all liked Tol very much. He was a good Ranger and quite a character. In fact, I need to get with Joaquin and collect some Tol Dawson stories about his days as a Ranger in Co. D, under the command of Capt. A.Y. Allee. At any rate, my old original gun rig wore plumb out. And, sadly, Ranger Tol Dawson has long since stepped on a rainbow. Fortunately, Mike Barranti recently went out to visit with Bart Skelton at Bart’s place near Horse Thief, New Mexico. In the course of that visit, Bart let Mike examine several Tol Dawson holsters that Bart had collected. Being a serious holster maker, Barranti took photos, measurements….even borrowed one of the originals to take home and study. The result is Barranti’s Border Ranger holster, an exact copy of Tol Dawson’s design and built to honor the old Ranger. The leather in Barranti’s holster is from the finest cut of the cow hide. The holster fits my Commander perfectly. And the flower carving is just downright beautiful. You can read about my lightweight Colt .45 Commander project and those fine silver stocks by Kevin Johnson in some of my previous posts. I think I will dub the entire project The Texas Border Special. It is especially pleasing to join Mike Barranti, Bart Skelton, and Joaquin Jackson in honoring Tol Dawson…a good man, a good friend, and a damn good Ranger! This entry was posted in Gear, Guns, History, Men At Arms, Peace Officers, Projects, Semi-Auto and tagged .45 ACP, 1911, Baranti Leather, Bart Skelton, Capt. A.Y. Allee, Joaquin Jackson, texas, Texas Ranger, Tol Dawson. Bookmark the permalink. What a beautiful rig & pistol.